Page revised in February 2017. The locations covered in this section were visited in April 2012. You may wish to read a page with an introduction to this section and a map first. Kerouan was founded by Uqba ibn Nafi in the fiftieth year of the Hejira (a.d. 670). He proposed to his troops to found a city which might serve him as a camp, and be a rallying point for Islamism till the end of time. He conducted them to where Kerouan now is, and which was then infested with wild beasts and noxious reptiles. Ibn-Khaldoun states that he collected around him the eighteen companions of the Prophet who were in his army, and called out in a loud voice: "Serpents and savage beasts, we are the companions of the Blessed Prophet, retire! for we intend to establish ourselves here." Whereupon they all retired peaceably, and at the sight of the miracle many of the Berbers were converted to Islamism. Uqba then planted his lance in the ground and called out — "Here is your Kerouan" (caravanserai or resting-place) thus giving the name to the new city. He himself traced out the foundations of the Governor's Palace and the Great Mosque; the true position of the Kiblah, or direction of Mecca, is believed by Mohammedans to have been miraculously communicated to him by God. From 1895 Murray handbook for travellers in Tunisia and Algeria. The sturdy minaret of the Great Mosque very near the eastern end of the town indicates its original defensive purpose. It commanded a far reaching view over the barren country which separated Kairouan from the coast, where the Arabs feared a Byzantine army could land. The minaret as we see it today was erected in 836 on the site of a previous one. 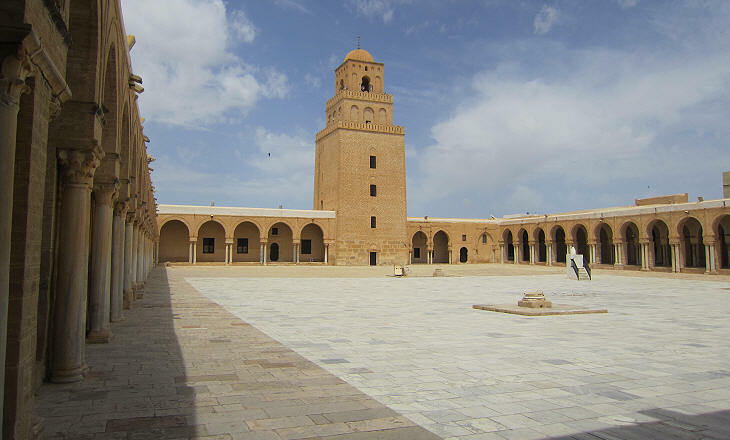 The exterior of the Great Mosque conveys the appearance of a fortress and, if not for the domed cell at its top, the minaret resembles the Tower of Khalef or manar (it opens in a separate window) built at approximately the same time at Sousse. Initially there was only one access to the mosque on the long side towards the town, another indication that the building was regarded as a sort of keep where the inhabitants could seek refuge. 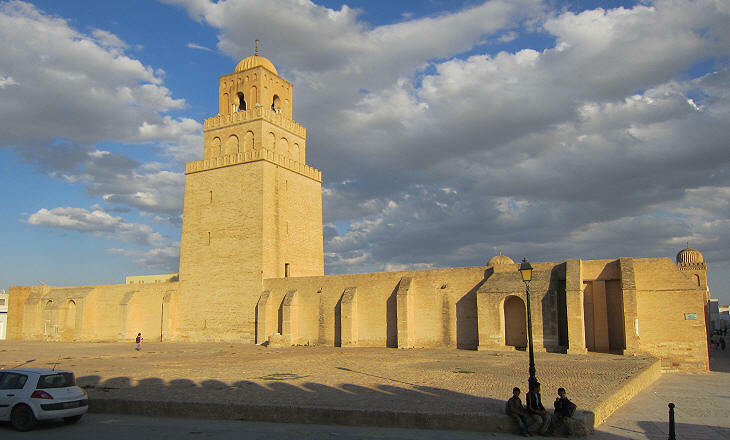 This defensive character is puzzling because the mosque was built in its current shape in the IXth century and at that time Kairouan was the capital of a powerful independent emirate ruled by the Aghlabids which included Sicily. The Friday noon prayer has a special importance for Muslims. It is a communal prayer which must be attended by all male members of the community, so Friday is known as the Assembly Day. 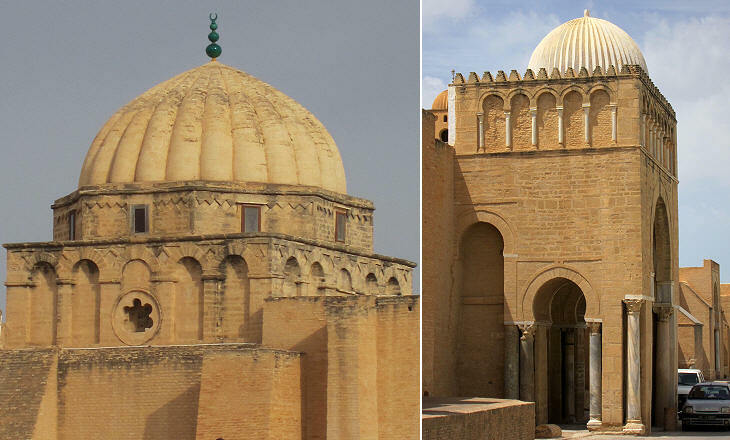 Very large mosques were built to allow all the inhabitants of a town to attend the Friday prayer together. Many Great Mosques are also known as Friday Mosques as at Bukhara. The absence of a central fountain makes the courtyard look wider than it is. Due to the lack of springs in the region surrounding the town the pavement of the courtyard is very gently sloping towards underground cisterns where rainwater was collected to allow believers to perform ritual ablutions. The porticoes which surround the courtyard were modified in the XIIIth and XVIIth centuries, but that which precedes the Prayer Hall is original. Faint traces of decoration can be seen on the ceiling, but nothing else diverts the attention of the viewer from the design of the portico with the perspective effect of its long series of columns. The archaeological sites of Roman towns in Tunisia (you may wish to see a section of them) retain many temples and buildings of the IInd/IIIrd centuries AD, but, with the exception of Sufetula, few examples of Late Empire and Byzantine churches. 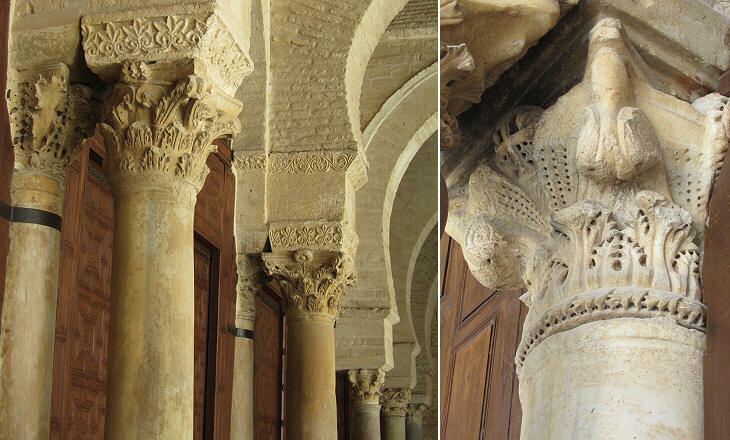 A visit to the Great Mosque of Kairouan and to that of Tunis shows where the columns of the great churches of Carthage and Hadrumetum (today's Sousse) have ended. Hadrumetum was the capital of Valeria Byzacena, one of two provinces into which Africa was split by Emperor Diocletian. 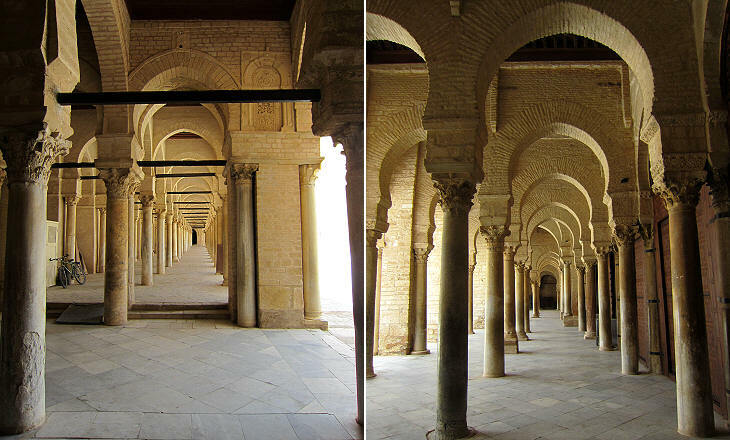 It is located 24 miles to the east of Kairouan and it is generally thought that the columns of the Great Mosque came from there. More than 400 ancient capitals were reutilized in the Great Mosque. 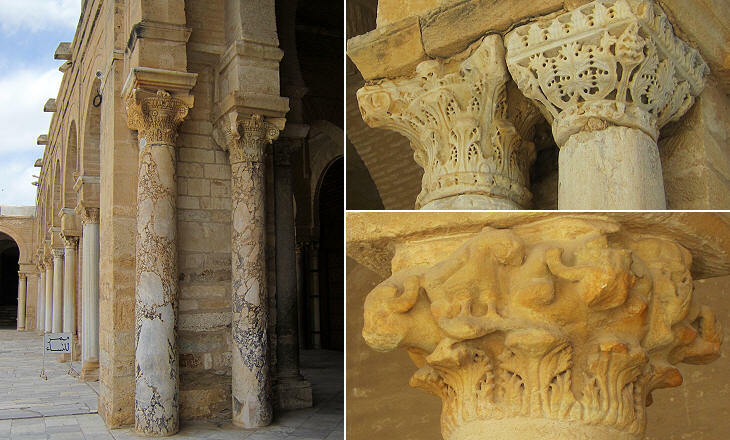 Compliance with the Muslim prohibition of portraying living creatures did not go as far as to deface capitals decorated with bulls, eagles and other birds. Even some capitals with a very noticeable cross were tolerated. 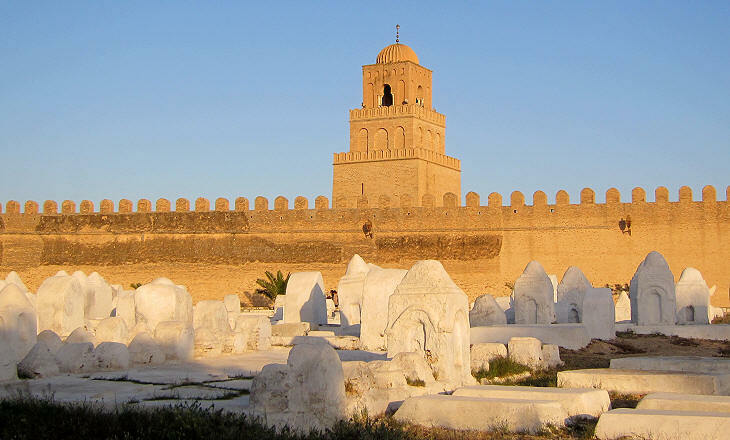 You may wish to see the Great Mosque of Damascus which was built with materials taken from churches and temples and the original design of which is similar to that of Kairouan. We have at Kairwan several fragments of ancient architecture and the Great Mosque, which is accounted to be the most magnificent as well as the most sacred in Barbary, is supported by an almost incredible number of granite pillars. 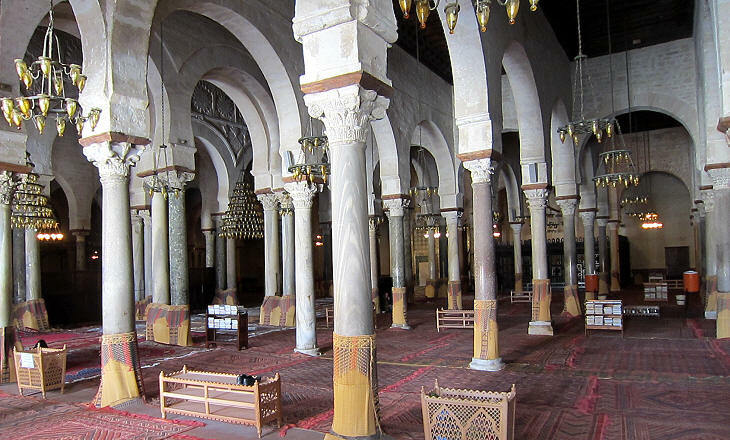 The inhabitants told me (because a Christian is not permitted in Barbary to enter the mosques of the Mahometans) that there were no fewer than five hundred columns. Next to Mecca and Medina no city was, till the French occupation, so sacred in the eyes of Western Mohammedans than Kerouan. Before the French Protectorate no Christian could enter its walls without a special order from the Bey, and a Jew did not dare even to approach it. Today visitors cannot enter the Prayer Hall, but they can see it from the portico during times when prayer sessions are not being conducted. 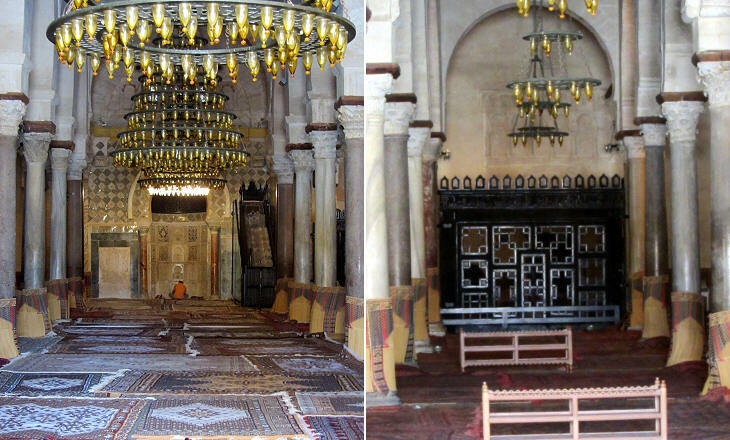 The Prayer Hall is seventeen bays wide and seven bays deep, so believers do not turn towards the mihrab when they pray (unless they are in the central bay), but stand or kneel opposite the wall where the mihrab is located. 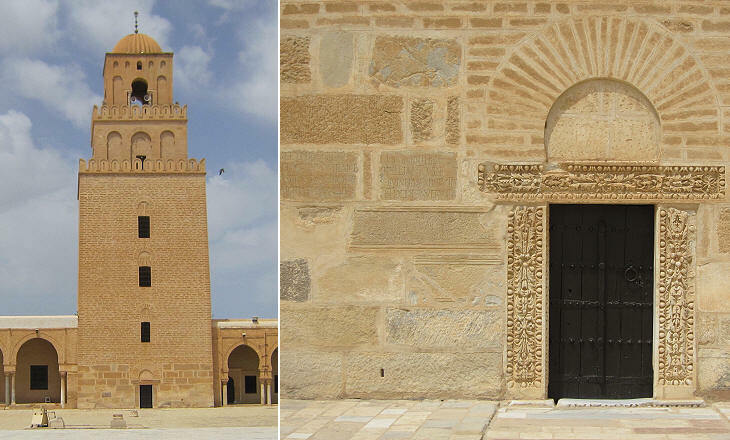 The Aghlabid rulers of Tunisia did not challenge the overall suzerainty of the Abbasid Caliphs and the complex polychromatic tiles surrounding the mihrab are said to have been imported from Baghdad, the residence of the Caliphs. The maqsura was added in the XIth century. The roof of the prayer hall is flat with the exception of two domes, one above the mihrab (dating from 836) and one above the entrance to the Prayer Hall. The latter is a modern reconstruction and it can be seen in the image used as background for this page. Bab Lella Rejana, a new entrance built in 1294 and paid for by a wealthy woman, is one of the very few additions to the Great Mosque. 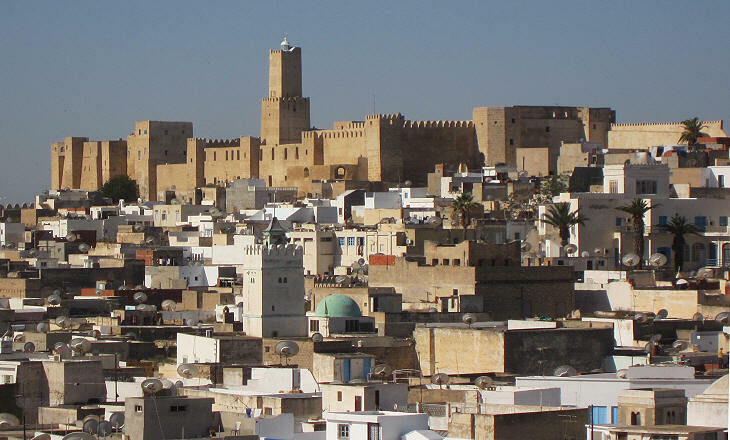 This because Kairouan was plundered in the XIth century by the Banu Hilal, an Arab nomadic tribe and eventually it lost its role of capital in favour of Tunis. I could not be informed of one single inscription in the Great Mosque. On the north-west side rises the minaret, a high quadrangular tower of three stories, each decreasing in height and breadth. Several pieces of Roman sculpture and inscriptions are built into the base. The presence of a Latin inscription of the time of the Severian dynasty split into two pieces of which one is upside down is rather puzzling. At Thugga, Musti and other ancient Roman towns one can see Byzantine fortresses with several inscriptions upside down or placed vertically. The inscription shown above is the only one in the courtyard of the Great Mosque, it is easily noticeable, it mentions several famous emperors and it is thought to have been placed on the minaret which preceded the current one, at a time when knowledge of Latin was still widespread. Considering that Arabic is read from right to left the fact of having placed upside down the second part of the inscription could have had a symbolic meaning, i.e. that the rule of Rome had been subverted.